Do You Need Any Extras? 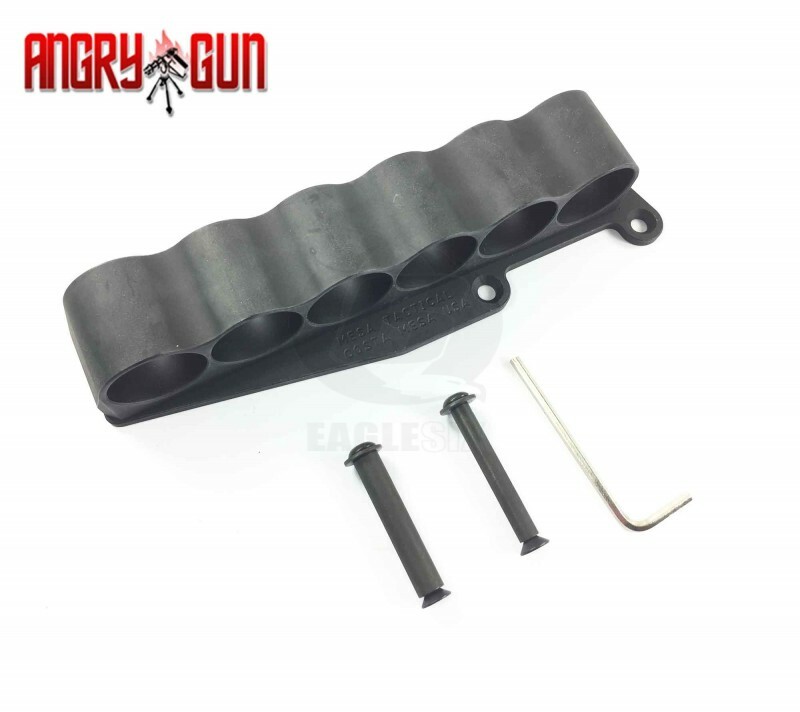 This is a strong metal shell holder in a mesa tactical style. This holds 6 shells and comes with mounting bolts and allen key as pictured. Because all brands have different dimensions we can only confirm this to be a 100% fit for the Tokyo Marui Guns listed below unless specifically stated otherwise. If you know other fitments for this product please email to let us know. Installing / fitting Airsoft gun parts will need varying knowledge from basic to advanced. Please refer to your local Airsoft Gunsmith for proper installation / fitting advise. Experienced fitting may be needed for some part's as the condition / compatibility of each Airsoft gun might vary and incorrect assembly can lead to premature failure of parts which is not our responsibility. Eagle6 Airsoft will dispatch your order according to the delivery method you have chosen during the purchasing of products from this website. All items will be dispatched within 1-2 working days of an order being placed with us. Shipping costs are calculated on an individual purchase basis and are calculated by this website. Eagle6 Airsoft has no letter option only small parcel, Unfortunately this means sometimes small thin items will go through as a letter, this is because most of our items we sell are small in weight but just slightly to wide for letter, for instance a Prometheus air nozzle will be light enough for letter, but to wide once packaged. The auto calculator cant distinguish the difference, it only recognises based on weight. We reserve the right to send some smaller parcels as letter even though you have been charged for small parcel. We cut costs very close on the parcel service and any extra we may make in parcels going through as large letters simply goes back intowards costs. We can not treat some different and others not and also we dont have time to individiually manage each order this would detract from other services. We Now only provide Tracked or Signed Options, unfortunatley this raises the price but this prevents issues and claims of non receipt. During busy times the tracking number will often get ouploaded to the account and an auto email sent upto 5 days after your order has been dispatched. This may mean a period of you not knowing if your parcel is dispatched. Rest assured all orders are dispatched within 1 - 2 days. Our order system uses checkout method via an account or paypal quick cart, if you use the payp[al quick cart it will record on our system as normal, BUT you will not get an automated email with order reference number, for some reason this only happens if you log into your actual account. Also using the quick cart method it will not store your order on your account. If you want to build up an account history then please make an acount and be sure to log into it before every order. * Eagle6 Airsoft Reserves the right to ship some items of a heavier nature second class parcel service. Once a product is shipped you will receive an email and your order status will move to completed from processing. International shipping is automatically calculated based on The Royal Mail Airmail prices to each specific country. If you have any Questions about international postage to your country please email us at info@eagle6.co.uk. © 2018 Eagle6 Airsoft's Online Store. All Rights Reserved.